BURBANK, CA., (July 7, 2011) -- Get set to fall in love with Mike & Molly, the smash-hit romantic comedy series to be released on DVD and Blu-ray September 20, 2011, by Warner Home Video (WHV). Created by Mark Roberts (Two and a Half Men), Mike & Molly is an edgy, laugh-out-loud comedy about a Chicago couple who begin a romance after they meet at an Overeaters Anonymous meeting. 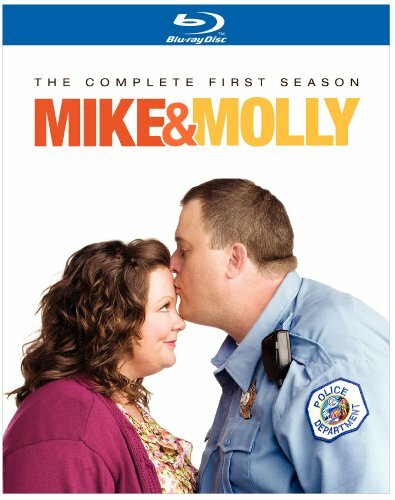 Titled Mike & Molly: The Complete First Season , the Blu-ray hi-def edition of this release will retail for $54.97 SRP while the standard definition edition will retail for $44.98 SRP. The release will be timed to the show's second season premiere on CBS. Executive produced by Chuck Lorre (The Big Bang Theory, Two and a Half Men, Dharma & Greg, Roseanne, Cybill), Mark Roberts (Two and a Half Men), Don Foster (Two and a Half Men, The Big Bang Theory, Roseanne) and James Burrows (Will & Grace, Friends, Frasier), Mike & Molly is a love story about two ordinary yet extraordinary people, Mike (Billy Gardell, My Name Is Earl), an affable police officer, and Molly (Melissa McCarthy, Samantha Who?, Gilmore Girls), a smart and cheerful teacher, who have always protected themselves and relied on their ability to laugh through life. With each other's support and the help of the Overeaters Anonymous meeting where they met, Mike and Molly learn to open up and trust one another. But falling in love is no easy task, especially when surrounded by friends and family who are just a little too close – and a little too opinionated. In addition to Gardell and McCarthy, the series stars Reno Wilson (Crank), Katy Mixon (Eastbound & Down), Nyambi Nyambi (Law & Order), Louis Mustillo (City Island), Cleo King (The Hangover), Rondi Reed (You Don't Know Jack) and Swoosie Kurtz (Pushing Daisies, Sisters). Mike & Molly, which airs immediately after the #1 comedy hit, Two and a Half Men, became the highest rated new comedy of 2010, averaging over 11 million viewers. The series is produced by Bonanza Productions Inc. in association with Chuck Lorre Productions and Warner Bros. Television. * Falling in Love With Mike & Molly – In this feature, we turn up the heat by creating fun cast pairings who interview each other about the experience of being a part of TV's # 1 new comedy. * Mike & Molly Play Acts (2 parts) – Hilarious, never aired scenes filmed in front of a live studio audience. * An Interview with Jim (the dog) – Rondi Reed (Peggy) and Jim the dog are interviewed about what it's like for Jim to be America's most-watched dog since Eddie from Frasier. "Mike & Molly has quickly become a fan favorite because it offers viewers smart and edgy humor coupled with a great story about how wonderful and stressful falling in love and starting a relationship can be," said Rosemary Markson, WHV Vice President, TV and Special Interest Marketing. She added, "When you get a series from the creative minds of Two and a Half Men, you know you are in for some major laughs and a good time. Billy and Melissa are hysterical together and they share great chemistry along with the show's gifted supporting cast. We are delighted to bring this new comedy hit to DVD and Blu-ray."